The Nation has just published its August 31/September 7, 2015 issue, "New Orleans 10 Years Later." This is a haunting and enraging review of how an immense human tragedy, driven by epidemic racism, has hollowed out the center and the soul of a great American city. Mychal Denzel Smith's article, titled "George Bush Doesn't Care About Black People," turns this indictment of the President, by Kanye West, into a reflection on the nation that elected George Bush (twice), arguing that the President was, truly, the nation's elected representative, and providing a reason that the Black Lives Matter movement must succeed. Another magazine, The Atlantic, is also addressing the topic of New Orleans, on the ten year anniversary of the disaster. The Atlantic regularly makes available an online "Photo" collection that often provides striking photographs, usually all related to a particular topic, but sometimes being simply a compilation of images from the week just past. I certainly encourage interested persons to sign up to receive The Atlantic's free email bulletins about their latest photographic collections, and I particularly encourage anyone reading this blog posting to review The Atlantic's just-published collection, "New Orleans, 10 Years After Katrina." This latest collection of photographs includes the photo above, depicting the so-called “Great Wall of Louisiana,” a 1.8-mile-long concrete wall located east of downtown New Orleans, photographed on August 19, 2015. 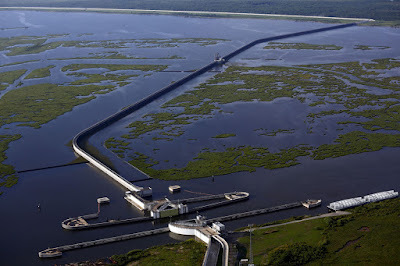 According to The Atlantic, "this barrier was designed to reduce the risk of storm surge in many parts of the city that were flooded during Hurricane Katrina due to levee or floodwall failures." As The Nation's articles make clear, the horror after Katrina was a "man-made disaster," but I think that any fair review of the entire collection just published by The Atlantic will also lead to a further insight. Any effort that seeks to "wall off" our human world from the World of Nature, in whatever form we might seek to accomplish that task, is not likely to be successful. Living within the World of Nature, and respecting its limits and its priorities, is a far better strategy. What a privilege to shout down from your hillside home to the poor man living below sea level that he ought to respect the limits of nature.